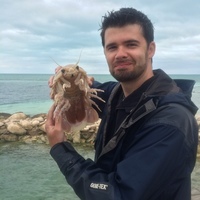 Alex Wilson has just started an Alfred Deakin fellowship to work with Assoc Prof Pete Biro on topics related to individual variation in behaviour. Like Pete, his study animals are mainly wet and fishy, but he has worked on other animals including crickets. Topics he has studied include sociality and ‘social networks’, selective effects of fishing and ontogeny of personality traits. More details on his research available HERE. Welcome Alex, we are happy to have you with us! !